Dubai is full of jaw-dropping views from its myriad of skyscrapers, but for those who demand a fresh panorama without moving to a new home there could be a solution. First announced back in 2008 before being put on hold, Dynamic Architecture’s rotating skyscraper project has been rekindled. 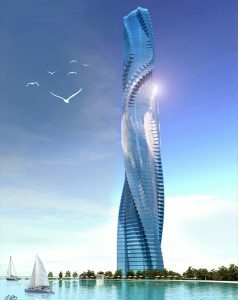 The idea is that the building, known as the Dynamic Tower, will be built in four dimensions and will constantly change shape. “It will never look the same,” said Israeli-Italian architect David Fisher, speaking recently on Your Discover Science channel on YouTube. “The floor is rotating very smoothly. You don’t hear anything,” he said. How would this work? According to Mr Fisher, each apartment would be able to independently rotate 360 degrees, with the speed adjustable. A stationary core would be built containing the elevator, with the apartments connected onto the centrepiece. Perhaps most remarkably of all, the project is planned to have no electricity costs as wind turbines would be placed between the floor of each storey. “It is a green power station. It will power the entire building,” said Mr Fisher. 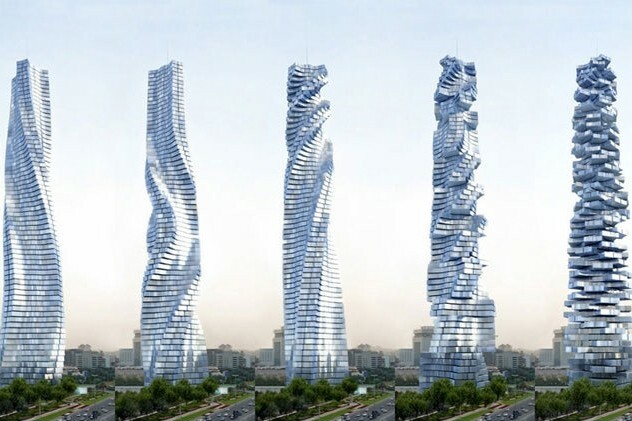 It is also planned to be the world’s first pre-fabricated skyscraper, whereby individual units are built off site, including plumbing and electrical connections, before being hung from the central core. Customising your own view is envisioned to come at a heavy financial cost, however, with as much as US$30 million quoted in the programme. Details of when the project could begin and where it may be located have not yet been given. The UAE is home to a number of rotating restaurants, and there were separate plans for a rotating residence in Dubai. In 2015 it was confirmed that High Rise Properties’ Dh250m Rotating Residence had been cancelled. The 16-storey freehold rotating tower consisting of four town houses and retail areas in Jumeirah Village South was due for completion in 2008. All rights reserved to the initial publisher for The national.